Given we’ve looked at the membership of popular professional, academic and researcher focused social platforms, it’s time to consider other factors that should come in to play when you prioritise what platforms to join. A crucial factor should be what platforms are likely to rank well in search results when people search for you. Basically: adding researcher and academic focused platforms to the hierarchy BrandYourself identified in its 2012 infographic about getting higher Google search results. In the BrandYourself infographic, the only professional profile focused platform was LinkedIn, with other sites more content focused or general sites (e.g. WordPress, YouTube, Facebook and Twitter). 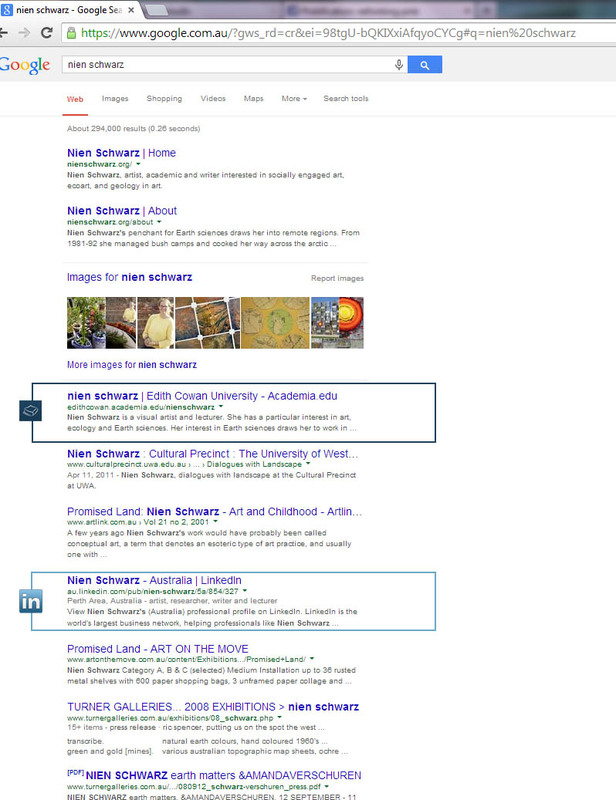 I looked at the first page of search results on Google (NB: I was not logged in to Google, being logged in can personalise results), for several researchers, a PhD student from another university and myself. All, barring the student, are working within the tertiary education sector. I identified results as follows: page/profile on their university’s website, page/profile on their university’s digital repository of research, profile on LinkedIn, profile on Academia.edu, profile on ResearchGate, profile on Google Scholar. This is limited to the first page of search results, because that is where most people are likely to start (and stop) their searches for information: as at June 2013 the first page of search results gets 91.5% of traffic. I don’t have a Facebook page for myself, or my blog, so it’s good to see no personal results are showing. Although not highlighted, my professional blog (that would be the one you’re reading this on) is immediately after item 4. This is a WordPress blog and ranks above my twitter profile, a deviation from BrandYourself’s suggested order, but no biggie from my perspective: I’d prefer you find my blog over my twitter profile. This researcher doesn’t have a ResearchGate or Academia.edu profile. Again: this researcher’s profile on their university site ranks quite highly (this can be a result of a good SEO strategy by their employer, but it is still worth noting even if it may be outside of their control and not a social platform). Separately: look at the content is also being retrieved elsewhere from their organisation, the last result is their profile in the digital repository of the researcher’s university. 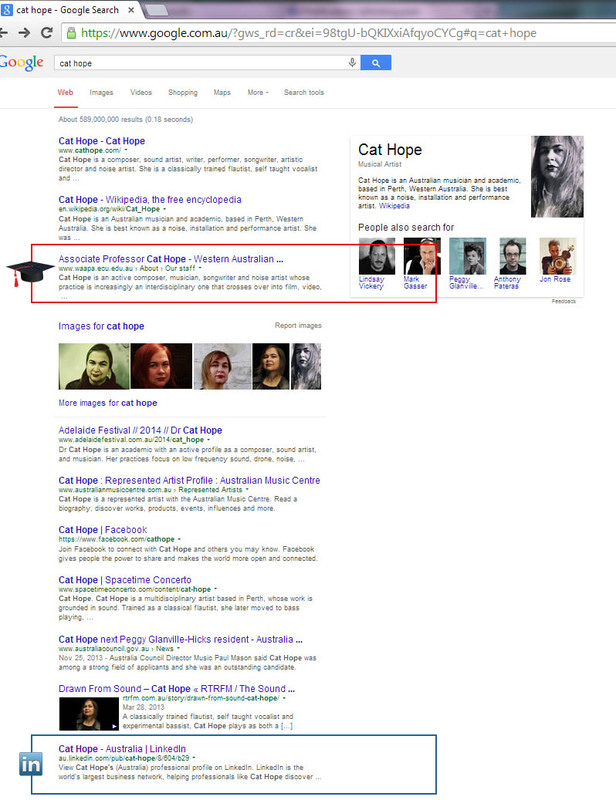 This researcher doesn’t have an Academia.edu profile. You’ll note a post about this researcher on university Facebook page and his own profile on Facebook sit at positions 5 and 6 in the search results respectively, aligning with BrandYourself’s hierarchy of search results. 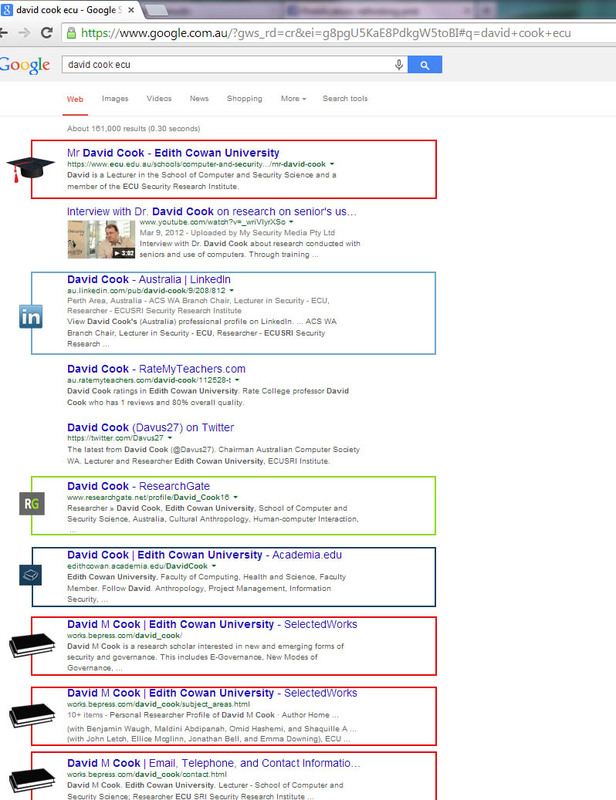 Again: this researcher’s profile on their university site ranks quite highly (yadda yadda…still worth noting). Separately: look at the content being retrieved from the digital repository of the researcher’s university: 3 separate results. 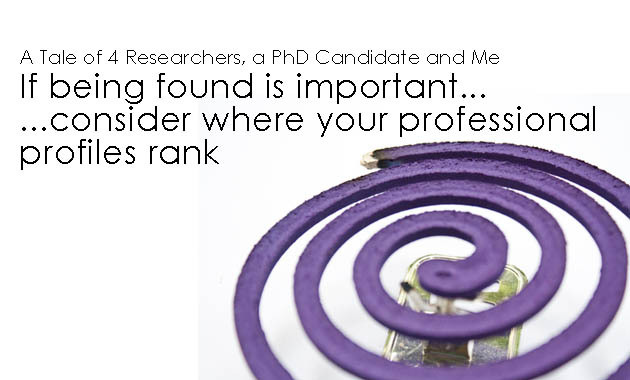 You’ll note this researcher’s Twitter profile sits at position 5 and 6 in the search results, aligning with BrandYourself’s hierarchy of search results. This researcher doesn’t have a ResearchGate profile, and their staff profile on their university site is not listed either. 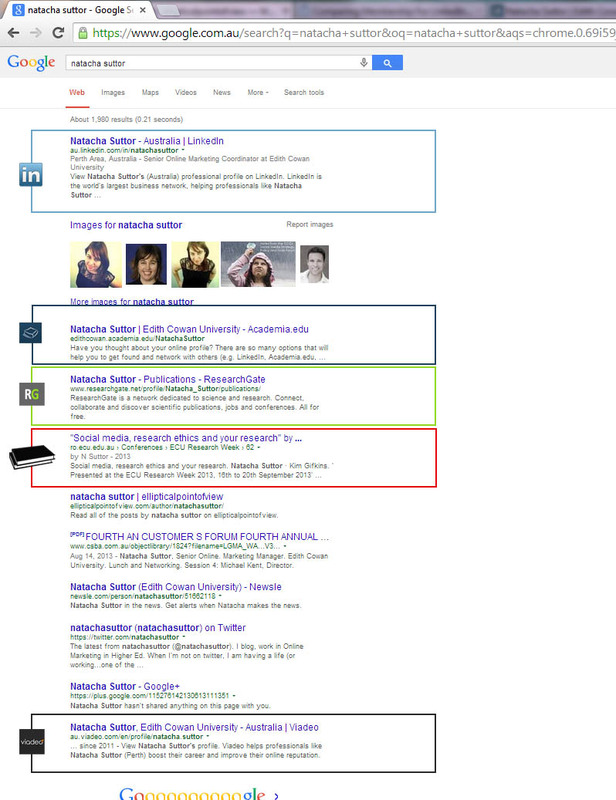 Only Miik’s LinkedIn profile appears in the first page of search results. 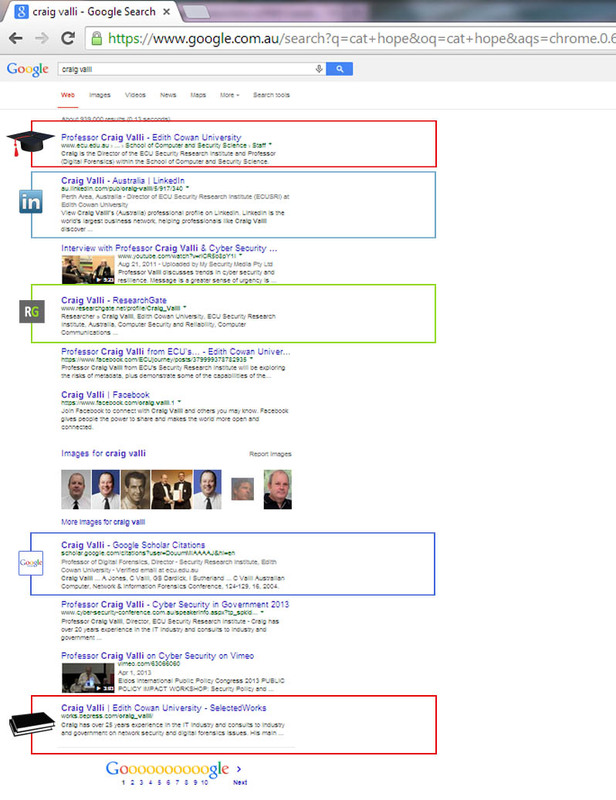 He does have an Academia.edu profile, but it doesn’t appear on the first page of search results. Based on the small sample, LinkedIn is definitely a priority however it’s important not to underestimate the non-social profiles on sites owned by universities and their digital repositories. In terms of the researcher and academic-focused platforms: Academia.edu and ResearchGate appear to be neck and neck while Google Scholar (another non-social profile) runs last in the race. In terms of other professional platforms my Xing profile doesn’t appear on the first page of search results at all, although my Viadeo profile does it is in the last spot on the page. It’s possible when other content is retrieved in these results the Viadeo profile will be pushed off the first page of search results. 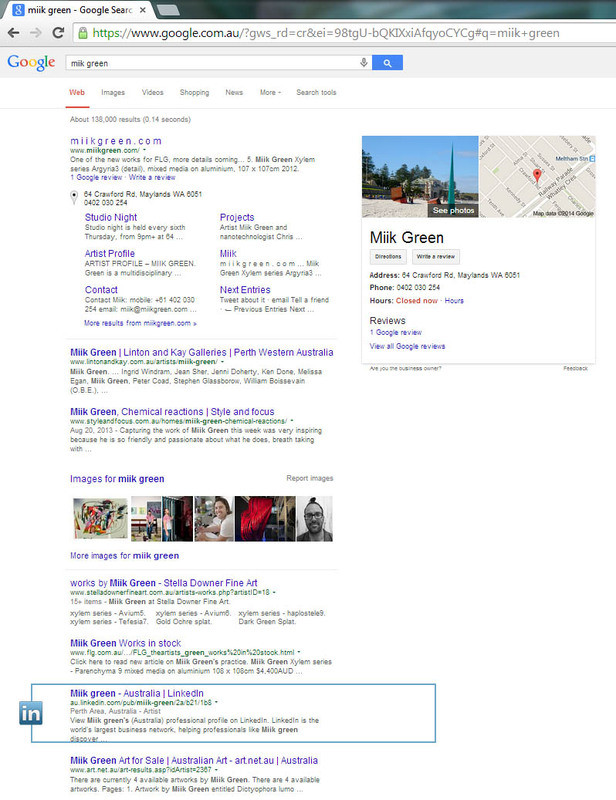 Again: search results are important (it’s how people find you) and organic search results like these are slow to change – it may take 1-6 months or more for changes in results retrieved to take effect – so there can be a lead time before you see profiles appear in results. How well platforms work together: do they allow you to link in new content or do they require you to upload new content?